Getting up at 4.30am is never a nice feeling, but getting up in the middle of the night in pouring rain seems just wrong. But we had no choice with the start looming at 6am in Palm Beach. A quick shower, some food, and after a short drive from our B&B we parked right next to the start line. 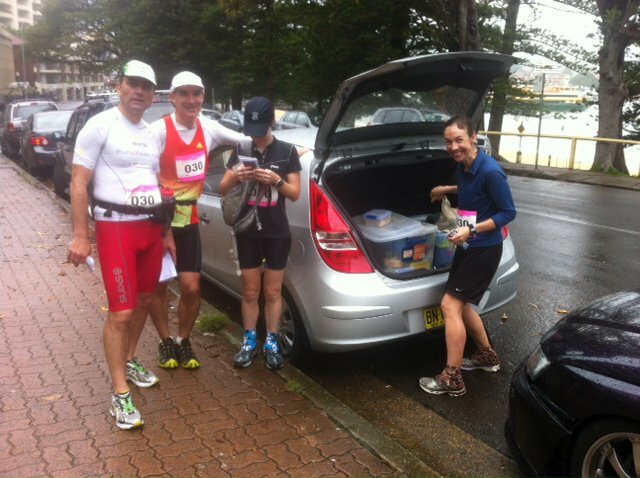 Denis waited in the car while I picked up the race bibs and caught up with Sam and Jo. We all squeezed into the small car just trying to keep warm and dry as long as possible. Uli hired the car to help us with food, drinks and anything else we may need along the way. We waited for 6am and just kept out of the rain – what a miserable morning. Suddenly the beach became alive with headlights and it was time for us to leave our warm cover and head down to the front of the starting line. Our plan was to sprint ahead of the field and get to the narrow steps at end of Palm Beach as the first team to avoid the congestion which would follow … 4, 3, 2, 1, GO! Off we went, across the sand and up to the esplanade. Funny enough we still tried to avoid the wet puddles, something Denis managed to keep going for the longest of us four, but we managed to get his shoes and socks soaked pretty soon too. The first 2km were rather steep uphills and initially we were hoping that with daylight near we would no longer need rain jackets, headlights and reflective vests, so we had our first catch up with Uli to get rid of that stuff. However, the weather made us think twice, and we kept our vests to protect us from the nasty wind and rain until the next meet-up. We soon got into a steady pace and realised that no other team was up to our speed or following us. We had such a great rhythm that we completely forgot about Uli at km 16, where she was desperately waiting for us, and when I realised at km 22 that we should have met Uli to stock up with food, we were again already too far gone ahead for the following meet-up. A quick scramble of phone calls and SMS got that sorted, and we made sure that after Curl Curl Beach we made rendez-vous to get new socks and necessary food. Running on the beaches was though and only by taking off our shoes and socks and running on the hard sand we moved steadyly forward. 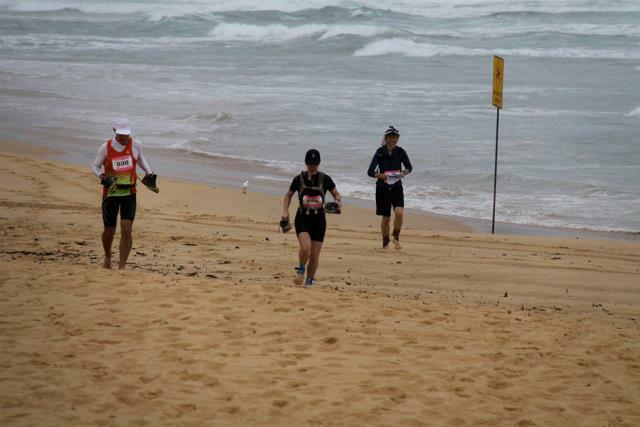 At Narrabeen Beach we suddenly had two other runners behind us – we realized that they were taking the easier part running on the road, but it kind of freaked us that we suddenly had competition breathing down our neck. When that team got close to us they kindly let us know that they were running the 50km race and with a sight of relive we took our much needed break to change socks and refuel with necessary calories. 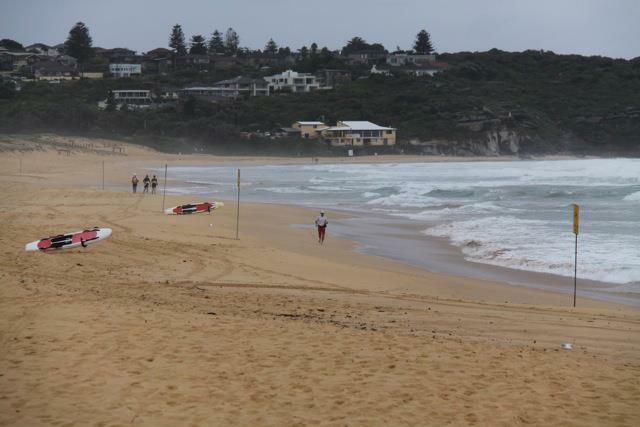 We tried to keep our stops as short as possible, and Sam was quick in reminding us that it is time to move, move, move … up the next headland, down to the next beach towards Manly and North Head. 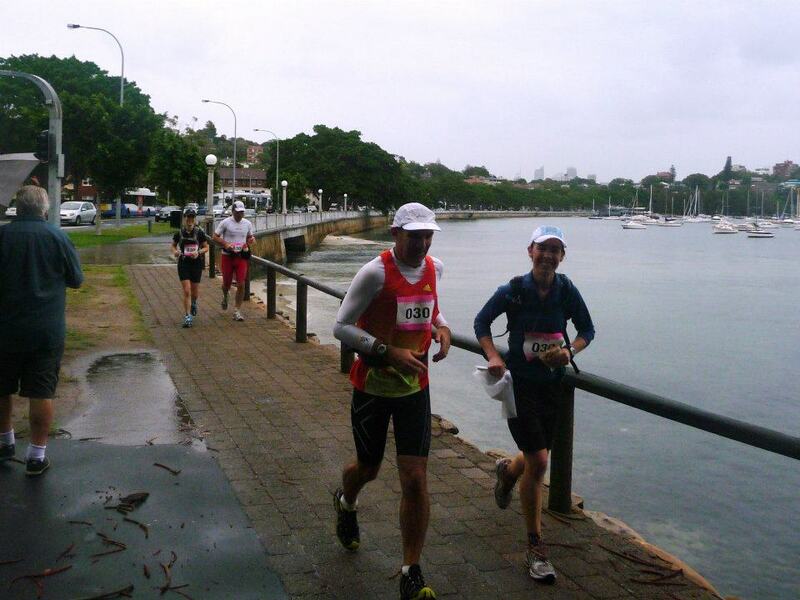 The longer we ran the more we got used to the wet, and I especially was happy we did not have a 30 degrees sunny day for this race. 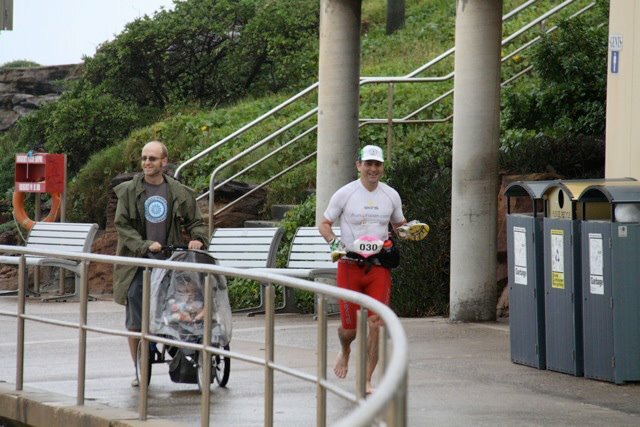 Near Manly Aquarium we caught up again with Duncan (Jo’s husband), baby Leah and Uli for our next pit-stop at km 38. 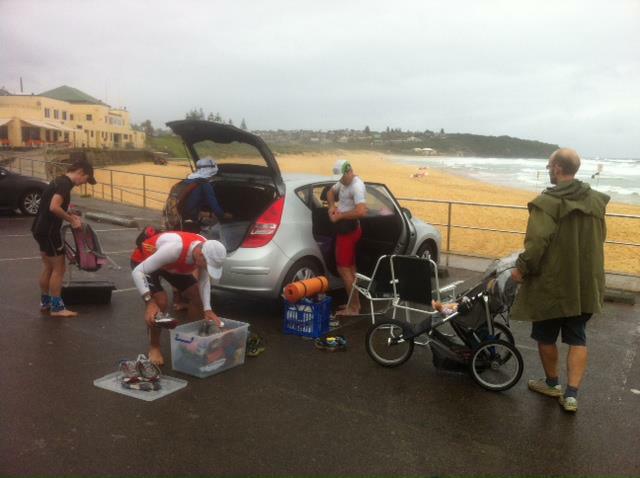 Poor Uli, after having the stress of us missing her earlier, also had to battle with a flat tyre on the way to Manly. Luckyly Duncan was the man on hand and helped to get our support mobile back on the road in time for our meet-up. 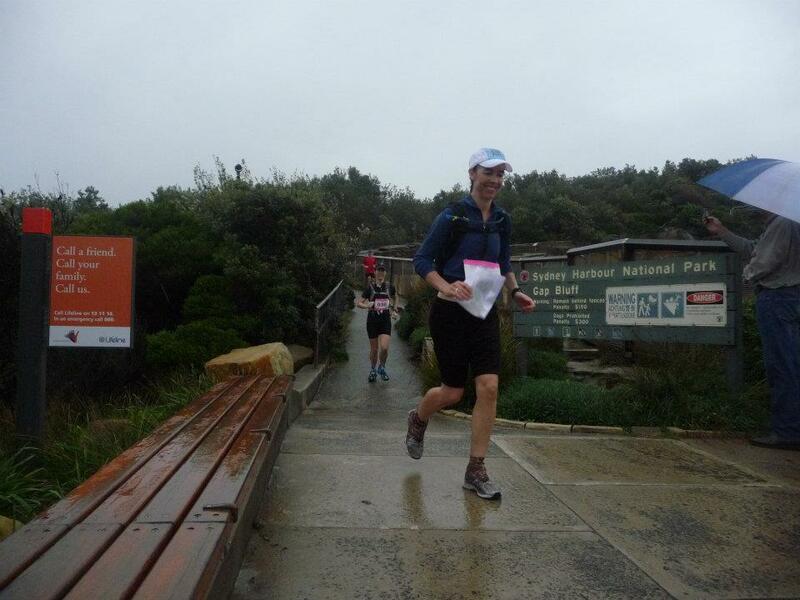 The next section was Manly to Spit Bridge through a beautiful, muddy, wet and ful-of-leeches National Park – not my favourite part of the race, but with Sam putting on a hard pace, there was no time to relax or complai. After a nice dry spell the rain started again and my fluffy clean socks did of course not stay dry for long. Up and down and out to the headlands for one of the next of 22 check-points, we made our way to the Spit Bridge, where we caught up with Uli for a quick stop before heading up another hill towards Balmoral Beach. Finally the beach opened up in front of us coming down another rainforest trek. Jogging towards the southern end for the halfway mark knowing some goodies will be waiting for us. 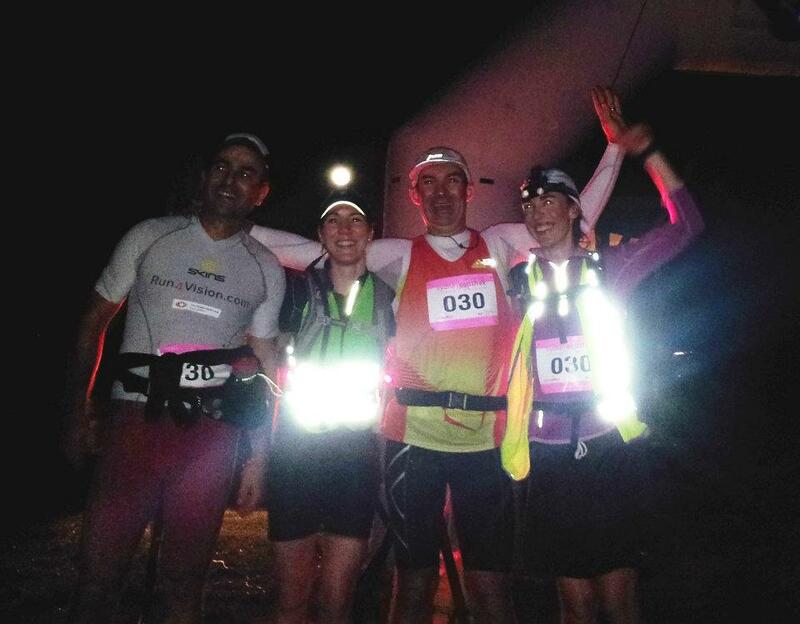 Cheers went up as we arrived – after two 50-km teams before us, we were the first team of the 100-km event to arrive. A quick interview from Denis and a mouthfull of chocolate cake, we were off attacking those never-ending stairs towards Chowder Bay. Sam reminded us that there was still a marathon to run, so off we went again, nicely warmed up and ready to getting over the Harbour Bridge and homewards bound. Crossing that bridge kind of was a mile stone as Denis and I now felt like being on home turf, and even though the distance still seemed long we knew we were on the way to the finish. 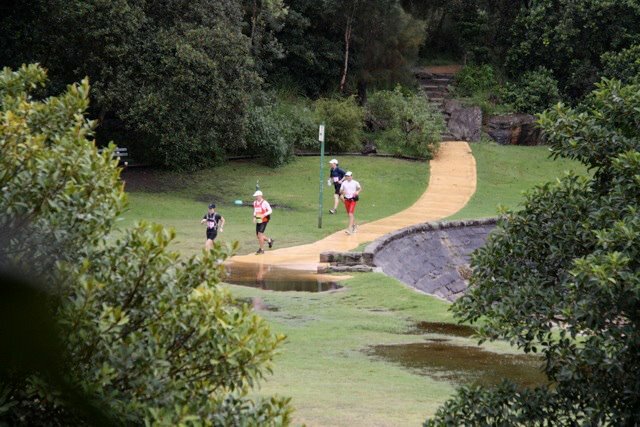 A quick stop at km 72 in Rushcutters Bay for some pain killers and food and we headed up a steep hill only to get down on the other side to Double Bay, and up again before finally arriving at Rose Bay – km 75 and the last maned checkpoint before the finish. On the way to Rose Bay I was walking up a hill a bit ahead of the team when a car stopped beside me and the lady driver offering me cash for our cause! So some women out there new there was a race on, which was kind of nice, as most of the time people along the way looked at us wide-eyed but not knowing what we were up to being all miserably soaked and running in the rain. Rose Bay was a quick stop to pick up new food supplies, a nice hot tea and some encouragement from family and friends. A few kilometres into the trek towards Nielsen’s Bay and Watson’s Bay two mates of Denis, Nick and Dave, joined us for a few kilometres and that certainly helped taking our thought off the pain we all felt now everywhere. We were chatting along and before we realised it we were out on South Head, around the lighthouse and jogging towards the Gap for one last stop of chicken soup and some more painkillers. Saying good-bye to the guys we headed off along the cliffs towards Bondi and the finish. Sometimes when you know the trek too well it seems endlessly long when you try to race against the clock and the fading daylight. 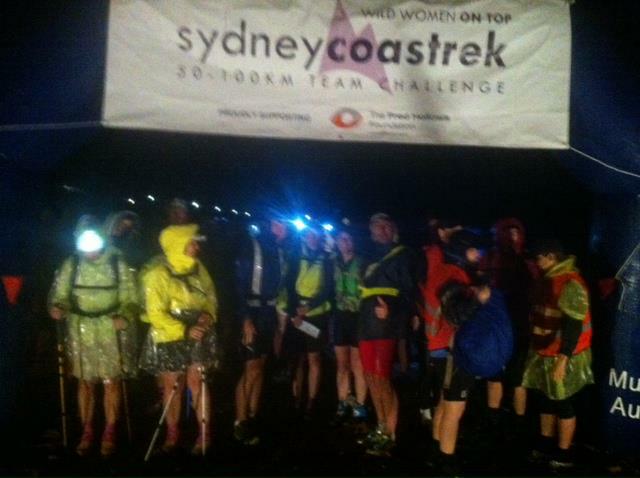 Thanks to Sam and Jo’s powerful torches we found our way along Bondi Beach, Tamarama, Bronte and finally the bright flashing beam of the finish was in view on the other side of Coogee Bay. One last effort heading up that hill towards Grant Reserve and we could see the finishing line. Arms in the air, smile on the face, we finally we crossed the line – as the first team to finish the 100-km Coastrek 2012 between Palm Beach and Coogee Beach in 14hrs 28min 55sec. It was a hard, long, wet day and after a few photos and hugs we only dreamt of was one thing: a hot bath, some food and a bed! I was comatose within an hour of crossing that finish line not realising that the poor volunteers in the finish tent had to wait over 4 hours for the second team to arrive at 1am in the morning. There will always be a first and last over the line but that night and next morning there were only winners crossing that line. 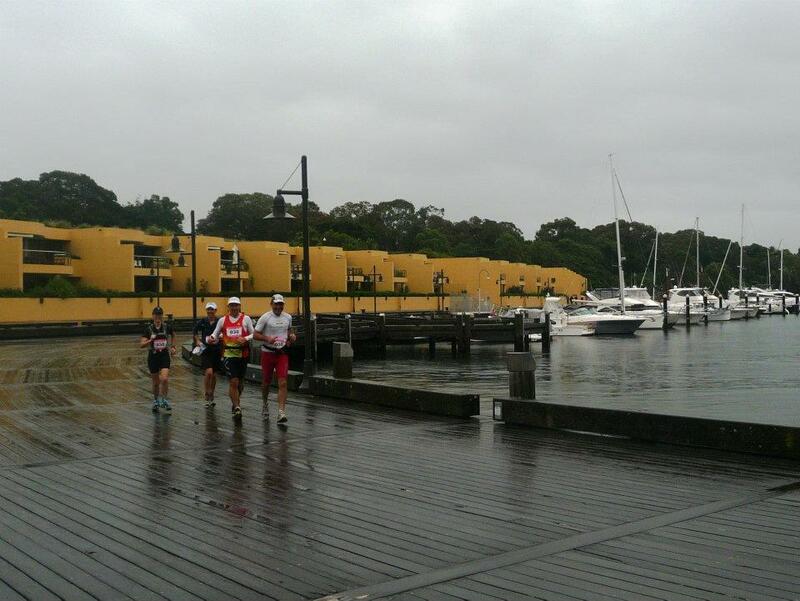 Overall 1200 ‘crazy’ but dedicated joggers and walkers battled the elements for a great cause and with the support of all our friends, families and strangers we will be raising the much-needed $1,000,000 for The Fred Hollows Foundation by 20 March. 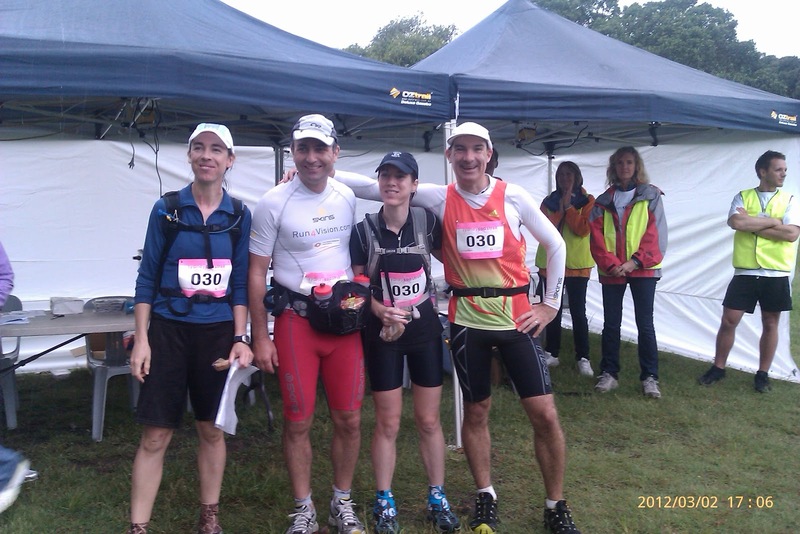 A special mention goes to the Achilles Athletes – Ben’s team of four visually impaired walkers who, with their dedicated four guides, walked for over 17 hours from Palm Beach to Balmoral battling slippery rocks, muddy tracks and pouring rain – all for making a difference to some needlessly blind person in raising money for The Fred Hollows Foundation. They probably are the real winners of Coastrek 2012. And a big thank you to our support crew, Uli, Suzi, Duncan and Adam, for being there for us when we needed them most and for their patience in the last couple of months.